Larry Geller is an expert on celebrity style and beauty who, along with the famed Jay Sebring, in 1959 opened America’s first men’s hairstyling salon. They quickly attracted the greatest names in the entertainment world, including Frank Sinatra, Paul Newman, Steve McQueen, Peter Sellers, Marlon Brando, Glen Campbell, Tony Bennett, Rock Hudson, Roy Orbison, Kirk Douglas, and many other celebrities, from Hollywood’s most prominent directors to major film/TV producers and agents. 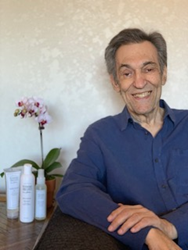 Larry and Jay were pioneers who introduced their natural, holistic way to achieve healthy, beautiful hair with organic, natural shampoos and personalized styling. In 1964, Larry left to become personal hairstylist and spiritual mentor to Elvis Presley, a relationship that lasted until Elvis’ passing in 1977. Wisdome Organics is respectful of the earth and all its creatures, using no harsh chemicals and never testing on animals, connecting with Larry’s philosophy and the foundation of Wisdome Organics. Larry Geller’s free e-book, available at https://wisdomeorganics.com/holistic-hair-care/#ebook explores nutrition, exercise, meditation and enlightened haircare for ageless beauty and wellbeing. Follow Wisdome Organics at https://www.facebook.com/WisdomeOrganics/. Follow Larry Geller at https://www.facebook.com/LarryGellerOfficialFanPage/.